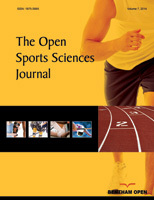 Δημήτριος Dimitrios P. Panagiotopoulos (2016) Physical Activities-Legal Horizon and Sports Regulation as Lex Specialis: Lex Sportiva, in:The Open Sports Sciences Journal, 2016, 9, (Suppl-1, M5) 35-42. Παναγιωτόπουλος (2015) «Ολυμπία και Ολυμπιακοί Αγώνες -Θεσμική Διάσταση –Προοπτική», σε:Πρακτικό 1ου Πανελλήνιο Συνέδριο - Πάτρα, 29-30 Μαΐου 2015. Πάτρα, σελ.177-183. Dimitrios P. Panagiotopoulos (2015) “Employments Relations In Sports Activities And Protection Of Individual And Economics Freedoms A Corpus Juris Athletiki “, in: International Sports Law Review Pandektis, Vol. 11:1/2, pp.8-20. Patsantaras Nikolaos (2015) “Can Sports Law Contribute to Regulating the under-Representation of Women in Sport Governing Bodies? 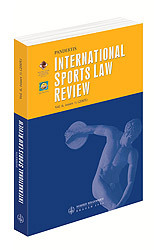 A Case Study in Greece” “, in: International Sports Law Review Pandektis, Vol. 11:1/2, pp. 128-138. Papaloukas Marios (2015) “Sports Image Rights in Greece”, in: International Sports Law Review Pandektis, Vol. 11:1/2, pp.172-188. Patronis Aggelos, Panagiotopoulos Dimitrios (2015) “Disciplinary Penalties to People Involved in Professional Sport. Concequences – Enforeability”, in: International Sports Law Review Pandektis, Vol. 11:1/2, pp.189-194. Panagiotopoulos Panagiotis(2014), “Global Sports Tourism and the Necessity of an Institutional Framework in Greece”, in: e- Lex Sportiva Journal, Vol. II: 2, pp. 389-398. 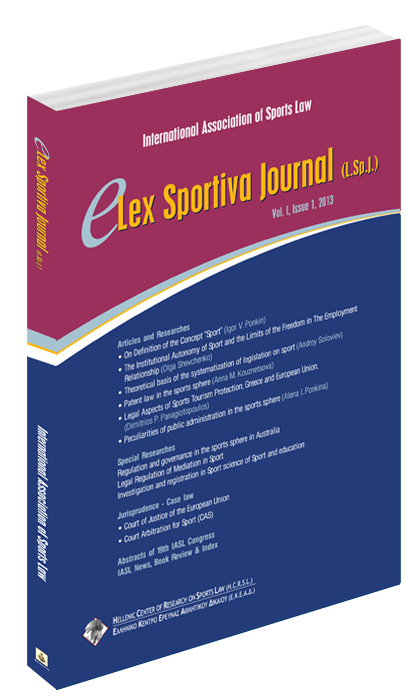 Papantoniou Alkiviadis (2014), "The Confrontation οf τhe Violence Arising From Sport Events - Sport Laws And Regulations About Football", in: e- Lex Sportiva Journal, Vol. II: 2, p. 467. Panagiotopoulos Dimitrios P. (2014), "Contracts for Sports Services", Kutafin University Law Review (KULawR), Vol.I:2, pp 191 -207. Panagiotopoulos Dimitrios P. (2014), “General Principles of Law in International Sports Activities And Lex Sportiva”, in: International Sports Law Review Pandektis, Vol. 10:3-4, pp.332-350, in: Επισκόπηση Αθλητικού Δικαίου Lex Sportiva ,Τευχ.10:2014 (in Greek), Τευχ. 10:2014, σελ. 2-11 και σε: Sports Science Research ( in Chinese) No 1, pp 74-81. Panagiotopoulos Dimitrios P., Karachaliou Aikaterini (2014) A Constitutional Chart of Sport Management for New Demands And Higher Expectations In International Practice, in: e- Lex Sportiva Journal, Vol. I:2, pp.173-183 and In Greek: Επισκόπηση Αθλητικού Δικαίου Lex Sportiva , Τευχ. 10:2014, σελ. 19-24. Panagiotopoulos Dimitrios P. (2013), “Contracts of Providing and Offering Sports Services”, in: e- Lex Sportiva Journal, Vol. I:2, pp. 149-168. Panagiotopoulos Dimitrios P. (2013), “Legal Aspects of Sports Tourism Protection, Greece and European Union”, in: e-Lex Sportiva Journal (e-Lex.SJ), VOl.I:1, pp. 34-39 and In Greek: Επισκόπηση Αθλητικού Δικαίου Lex Sportiva, Τευχ. 10:2014, σελ. 25-27. 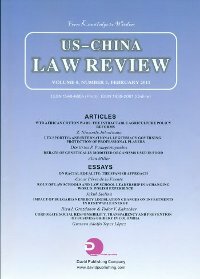 Dimitrios P. Panagiotopoulos (2013), “Sporting Jurisdictional Order and Arbitration”, in: US-China Law Review, Vol. 10:2, pp.130-140. Dimitrios P. Panagiotopoulos(2013), Sports liability and sports behaviour controlled by the sports law in Greece(Greece), Sport Science Research , (2): 12-16. Browse (84) Download(125). Δημήτριος Π. Παναγιωτόπουλος (2012) "Νομική αντιμετώπιση της βίας στους αθλητικούς χώρους", σε: ΠΟΙΝΙΚΗ ΔΙΚΑΙΟΣΥΝΗ (Ποιν. Δικ. ), 12/2012 (ΕΤΟΣ 15ο), σελ. 1145-1154. Dimitrios P. Panagiotopoulos (2012), “Lex Sportiva: International or sui Generis – ‘Unethnic’ Law?”, in: "SPORTS LAW: PROSPECTS OF DEVELOPMENT", sixth International scientific practical conference, Moscow State Law Academy et all, Russia. 30 May 2012 MoskBa, pp. 25-31. Dimitrios P. Panagiotopoulos (2012), "IASL Presentation on "The Status of Sports Lawyers in the World" on the Framework of Sports Law Section of the International Convention on Science, Education and Medicine in Sport", in: International Sports Law congress (ICESEMIS 2012), http://iasl.org/pages/posts/on_line_papers/on_line_papers309.php, Glasgow, Great Brittan. Δημήτριος Π. Παναγιωτόπουλος (2012), "Η διοικητική διαδικασία ενώπιον του ΑΣΕΑΔ" σε Διοικητική Δίκη, Τεύχ. 4, σελ. 817-830. Δημήτριος Π. Παναγιωτόπουλος - Ιωάννης Μουρνιανάκης (2011), "Αθλητικά στοιχήματα: Πολιτική στο επίπεδο της Ε.Ε.”, σε ΔΙΚΑΙΟ ΜΕΣΩΝ ΕΝΗΜΕΡΩΣΗΣ ΚΑΙ ΕΠΙΚΟΙΝΩΝΙΑΣ (ΔiΜΕ&Ε), Τομ. 8, σελ. 349-352. Dimitrios P. Panagiotopoulos (2011), “Lex Sportiva and International Legitimacy Governing: Protection of Professional Players”, US-China Law Review, Vol. 8:87, pp 122-136. 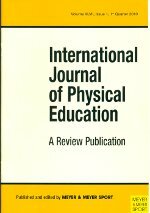 Dimitrios P. Panagiotopoulos (2010), “Institutional foundation of physical education and sporting contests”, International Journal of Physical Education, Vol. XLVII, issue 1, 1st Quarter 2010, pp 25-35.